It is becoming clearer every day that the United States and Germany instigated the crisis in Ukraine, installing a right-wing nationalist regime completely subservient to Washington and NATO, with the intention of provoking a confrontation with Russia. On Thursday, the Obama administration brushed aside conciliatory talk from Russian President Vladimir Putin and announced an initial round of sanctions, pushing the European Union to announce its own sanctions later in the day. Meanwhile, American warplanes have been dispatched to the Baltics and US warships have entered the Black Sea. In response to a unanimous vote by the Crimean parliament in favor of seceding from Ukraine and joining the Russian Federation and the setting of a referendum on secession for March 16, President Obama declared the holding of such a vote a violation of the Ukrainian Constitution and international law. As always—and as has been the case throughout this crisis—the statements of the US government are infused with hypocrisy. In 1992, following the dissolution of the Soviet Union, the United States pressed for the breakup of Yugoslavia. In 1999, it went to war against Serbia to secure the secession of the province of Kosovo. Washington’s position on one or another issue is never determined by the principles of international law, but rather by its calculation of US geopolitical and economic interests. Washington’s strategic playbook is all too clear: it made use of Ukrainian fascist “demonstrators” to topple the elected government of President Viktor Yanukovych and acquire unfettered control over the country. The Obama administration assumed that Putin would offer at least token resistance, if only to avoid an extreme loss of face. However, the US is not seeking a compromise with Russia. It wants Russia to make a humiliating climb-down, and is risking the outbreak of nuclear war in the process. The United States is demanding nothing less than Moscow’s acceptance of a hostile Ukraine that will serve as a forward staging post for US and NATO military forces and intensified operations aimed at dismembering Russia. In part, the stance taken by Washington reflects anger over recent events, specifically Russian support for the Assad regime in Syria and the decision by Putin to provide asylum to National Security Agency whistleblower Edward Snowden. Both cases are viewed as an expression of Russia’s refusal to accept unconditionally the global hegemony of the United States. Washington wants a sharp and permanent change in the relationship of forces between itself and Moscow. The Obama administration seems to be counting on Putin’s willingness to back down in the face of the combined military and financial might of US and European imperialism. But the fact remains that it has provoked a crisis that could spiral into a military collision with catastrophic consequences. Even if nuclear war is averted in this instance, the events of the past week have demonstrated that a new world war, utilizing nuclear weapons, is not just a danger. It is an inevitability unless the working class intervenes to put an end to capitalism and imperialism. This situation, and the position in which Russia finds itself, fully confirm the catastrophic consequences of the dissolution of the Soviet Union. The December, 1991 announcement by Russian President Boris Yeltsin and his Ukrainian and Belarusian counterparts Leonid Kravchuk and Stanislav Shushkevich of the dissolution of the USSR was the final act of treachery in decades of betrayal by the Stalinist bureaucracy of the October 1917 Revolution that created the workers’ state and the socialist and internationalist program upon which the revolution was based. The bellicose propaganda in the Western media about Russian “expansionism” is absurd. Since the breakup of the USSR, vast portions of the former Soviet Union and all of its East Bloc allies have been brought into the orbit of US and European imperialism. The fate of Russia has confirmed the warnings of the Trotskyist movement that the dissolution of the Soviet Union would result in the transformation of post-Soviet Russia into an impoverished and despotic semi-colony of Western imperialism. Prior to the breakup of the USSR, the linchpin of Stalinist foreign policy was “peaceful coexistence” with imperialism. The Kremlin used all of its influence to suppress the international working class struggle against capitalism in return for an imperialist accommodation with the USSR. In the final years of its rule, as it completed its repudiation of whatever remained of the legacy of the October Revolution, the Kremlin bureaucracy under Gorbachev acted as if imperialism was a Marxist fiction. As they dismantled the Soviet Union, the bureaucrats peddled the illusion that a capitalist Russia would be allowed by the United States and its European NATO allies to live in peace, as the new Russian biznismen grew ever richer on the plundered wealth of the old USSR. But imperialism is not a fiction. It is a brutal reality, and its geopolitical and economic interests rule out peaceful coexistence with Russia. 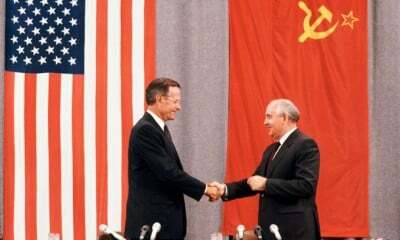 The opposition of the United States to the Soviet Union was based not only on the non-capitalist structure of the USSR. The United States could never reconcile itself to the fact that the Soviet Union, the creation of the October Revolution, deprived American imperialism of direct control over the vast natural and human resources of such an immense country. Even though the USSR no longer exists, the appetites of US and European imperialism remain. Thus, a weak capitalist Russia confronts the threats of American and European imperialism. Leading a regime that rests on an utterly corrupt elite—which has deposited a substantial portion of its ill-gotten riches in US and European banks—Putin relies on the reactionary mechanisms of military maneuvers and Great Russian chauvinism. Bereft of a coherent strategic vision—let alone one that would find support beyond the borders of Russia—he is looking for an avenue of retreat that will not leave his regime utterly humiliated and discredited. But it is not at all certain that the United States will ease the pressure, and the danger exists that the crisis may escalate out of control. In The Sleepwalkers, a recently published book on the July 1914 crisis that led to the outbreak of World War I, historian Christopher Clark calls attention to the recklessness of the European diplomats whose miscalculations produced a disaster. But compared to Obama and his European allies, the actors in the 1914 crisis seem almost models of restraint! Even if a way is found out of the present impasse, it will be only of short duration. Another crisis will soon follow. The crisis of February-March 2014 should leave no doubt that the imperialist system must lead to war. The only means by which this can be prevented is through the unification of the international working class in the struggle for socialism.